We are obsessed with finding efficient alternatives to random-walk MCMC for Bayesian phylogenetic inference. 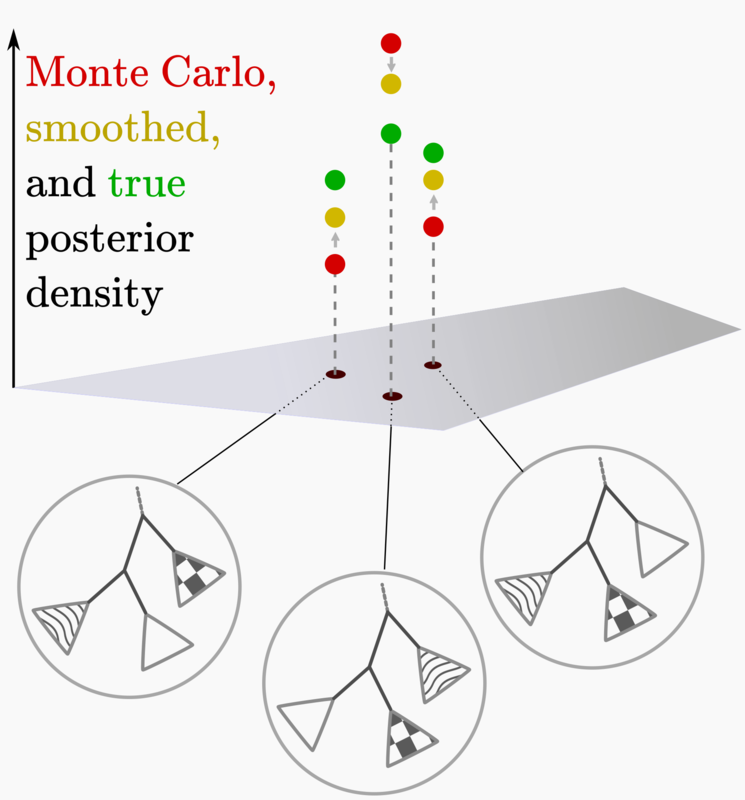 We have developed online sequential Monte Carlo theory and algorithms, phylogenetic Hamiltonian Monte Carlo, and inference via direct topology search and efficient marginal likelihood computation. 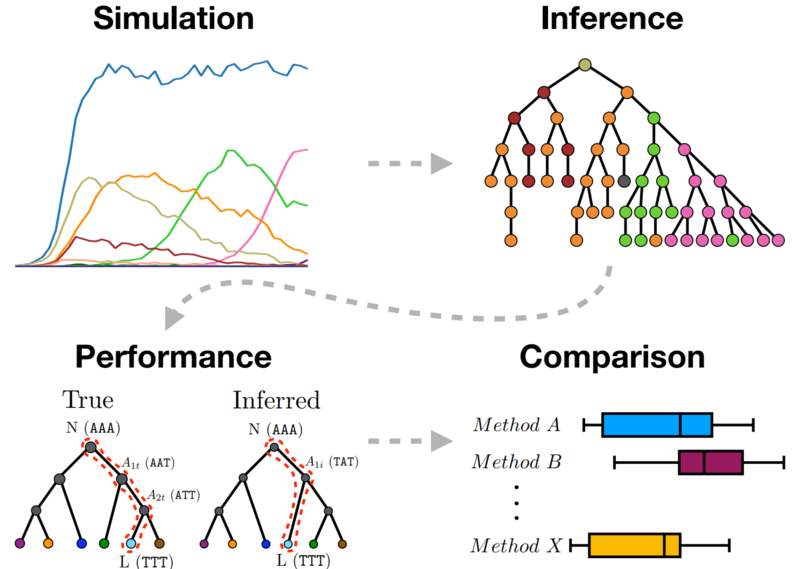 Come work with us on a strategy that is producing very promising results: variational Bayesian phylogenetic inference based on subsplit Bayesian networks. There are lots of opportunities for projects to flesh out this direction. We would like to find someone who can collaborate with us on methods development and implementation, thus knowledge of both Bayesian statistics and programming expertise are needed. Experience with an existing code base for phylogenetics would be a big plus. We’re stoked but are happy to wait for the right person to fill the position. If you aren’t ready until this summer, no problem! Apply here or just get in touch. Posterior probability estimation of phylogenetic tree topologies from an MCMC sample is currently a pretty simple affair. You run your sampler, you get out some tree topologies, you count them up, normalize to get a probability, and done. It doesn’t seem like there’s a lot of room for improvement, right? Let’s step back a little and think like statisticians. The posterior probability of a tree topology is an unknown quantity. By running an MCMC sampler, we get a histogram, the normalized version of which will converge to the true posterior in the limit of a large number of samples. We can use that simple histogram estimate, but nothing is stopping us from taking other estimators of the per-topology posterior distribution that may have nicer properties. High-throughput sequencing of our adaptive immune repertoires holds great promise for understanding immune state. These sequences implicitly contain a wealth of information on past and present exposures to infectious and autoimmune diseases, to environmental stimuli, and even to tumor-derived antigens. 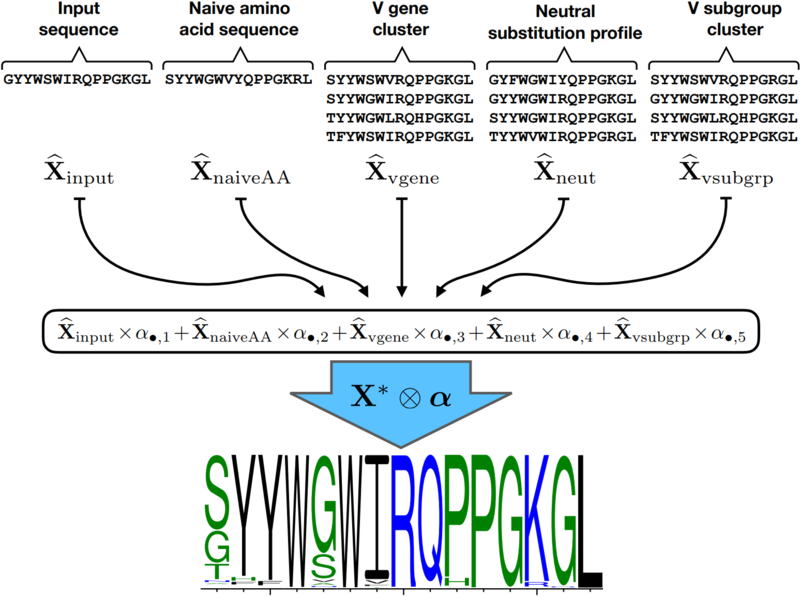 In principle, we should be able to use these sequences of rearranged receptors to infer their eliciting antigens, either individually or collectively. We’re starting to see neat progress in these areas for T cell receptors (TCRs). 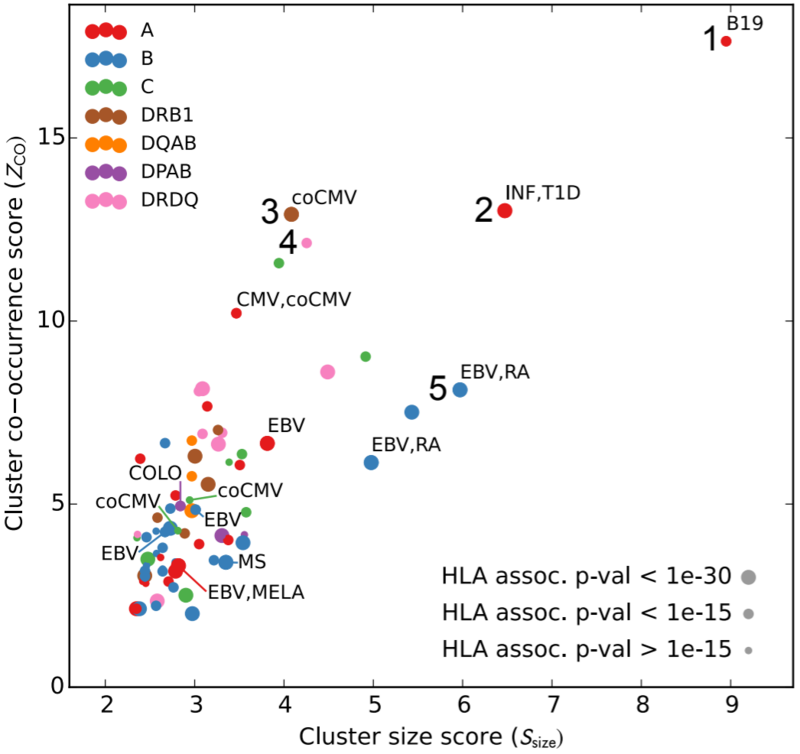 Some recent studies compare TCR repertoire between individuals who do or do not have some immune state, such as an immunization, an autoimmune disease or a viral infection and work to find sequence-level differences between the repertoires. The Walczak-Mora team recently upped the bar by not requiring a control cohort. There has also been interesting progress on predicting epitope specificity from TCR sequence using structurally-informed sequence analysis. Immune receptor sequencing is stochastic through and through. We have cells with random V(D)J rearrangements that are stimulated through some random process of exposures, which lead to some random amount of expansion, and in the B cell case there is some random process of mutation and selection. So why don’t we use methods incorporating that uncertainty into our analysis? If computation was no barrier, how would we design an analysis framework that integrated out uncertainty in unknown quantities and took advantage of the hierarchical structure inherent in immune receptor data? Sampling and sequencing, especially for direct sequencing of germinal centers, is dense compared to divergence between sequences. Because of the resulting distribution of short branch lengths, zero-length branches and multifurcations representing simultaneous divergence are common. The somatic hypermutation (SHM) process in affinity maturation is highly nucleotide-context-dependent process. Can we predict how sites of an antibody will tolerate amino acid substitutions? Kristian Davidsen posed this question shortly after he arrived in my group, pointing out that being able to do such prediction would be quite useful. For example, engineered antibodies sometimes aggregate into clumps or have other properties that that make them useless for mass production. If we could figure out ways to change the amino acid sequence of an antibody without changing binding properties, that could help us avoid aggregation and make a more useful antibody. Please see https://b-t.cr/t/506 for details. Every B cell receptor sequence in a repertoire came from a V(D)J recombination of germline genes. Each individual has only certain alleles of these genes in their germline, and knowing this set improves the accuracy of all aspects of BCR sequence analysis, from alignment to phylogenetic ancestral sequence reconstruction. This germline allele set can be estimated directly from BCR sequence data, and it’s time to treat such estimation as part of standard BCR sequence analysis pipelines. This central message is not new, but it’s worth emphasizing because doing germline set inference is not part of most current studies of B cell receptor (BCR) sequences. 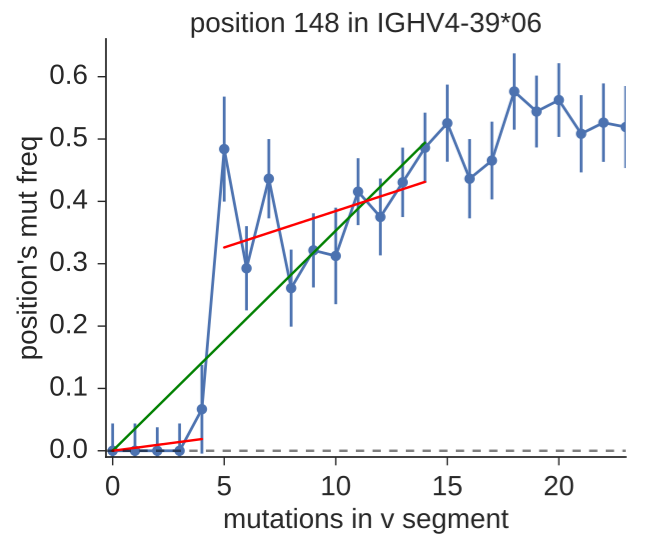 Indeed, the most common way to annotate sequences is to align them one by one to the full set of alleles present in the IMGT database, which has hundreds of alleles. Each individual has only a fraction of these alleles in their genome.